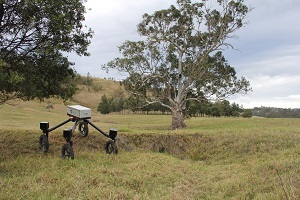 SwagBot can easily navigate bumpy places keeping tabs on cattle, as well as helping with guiding sheep and cows towards the pastures and keep them away from danger. The experts of the Australian Centre for Field Robotics have been testing the robot for two years already and the results are already impressive. According to the findings of the most recent research, the SwagBot is able to get around various barriers and cope with the tasks without continuous monitoring. The videos prove that cows respond pretty well to the movements of the robot even though sometimes they may seem quite awkward and deliberate. According to Salah Sukkarieh, the professor of University of Sydney, the robots will be equipped with sensors that will enable them to identify the condition of the animals in the field whenever required. For instance, the SwagBot will be able to find out whether the cow is injured or sick judging by its walks or body temperature. Soon, the robot will be provided with the option to monitor the pastures condition, identifying the best fields with the most plentiful grass. SwagBot is equipped with a hook on its back which enables it to carry an equipment. Thus, the machine can be used to transport food from farm barn to the pastures. But there is no doubt that the number one purpose of the invention is to monitor the animals such as cows and horses just like the herding dogs do. Due to the fact the SwagBot makes a lot of noise, it can easily hook and hold animals attention just like the inventors planned. In order to enable it to cope with the job that a man on a horseback is supposed to do, the SwagBot is equipped with an independent all-wheel drive. The latter enables the robot to climb over the rocks or even small trees if needed. Besides, the SwagBot can also move through mud, climb over the embankments and cross the flooded roads. Still, it’s hard to say how farmers are going to program or control the robot should it have a client-focused model; however, there’s a need for the GPS boundaries of this or that land to be pinned or plugged in on the map. The device will most likely have an interface easily accessed via the tablet or PC, letting the farm owners tweak their “robotic pet” before letting it loose into the meadow. Angelo, J. A. (2007). Robotics: a reference guide to the new technology. Santa Barbara, United States: Libraries Unlimited. Hashimoto, , “Humanoid Robots in Waseda University – Hadaly-2 and WABIAN,” in IARP First International Workshop on Humanoid and Human Friendly Robotics, Tsukuba, Japan, October 1998. Martinelli, A., Siegwart, R., “Estimating the Odometry Error of a Mobile Robot during Navigation,” in Proceedings of the European Conference on Mobile Robots (ECMR 2003), Warsaw, September 4–6, 2003. Róbert Szabolcsi: Extra-Cheap Solutions Applied for Non-Reusable Unmanned Aerial Vehicle Technologies, CD-ROM Proceedings of the VIIth International Conference „New Challenges in the Field of Military Sciences 2010”, ISBN 978–963–87706–6–0, 28-30 September 2010, Budapest, Hungary. Persaud and G. Dodd, “Analysis of Discrimination Mechanisms in the Mammalian Olfactory System Using a Model Nose,” Nature, vol. 299, no. 5881, 1982, pp. 352–355. Khatib. Real-time obstacle avoidance for manipulators and mobile robots. International Journal of Robotics Research, 5(1):90–8, 1986. Sian, T. Sakaguchi, K. Yokoi, Y. Kawai, and K. Maruyama, “Operating humanoid robots in human environments,” Proc. RSS Workshop: Manipulation for Human Environments, Philadelphia, PA, Aug. 2006.